Tune in to space with a homemade yagi antenna. Orbiting satellites such as AO-51, SO-50, and AO-27 act as repeaters, relaying signals from low-power transceivers like mine back to hams elsewhere on the planet. So if you know where to aim the antenna, you can communicate around the world via space. The ISS also has a repeater, and occasionally, when we’re lucky, the astronauts themselves exchange transmissions to communicate with hams on the ground. To listen to these signals from space, you don’t have to be a licensed ham radio operator, or even stand on the roof. You can do it in your own backyard with an off-the-shelf UHF FM radio. The whip antenna on the radio might let you hear satellites and the ISS, but you’ll get far better reception by making your own yagi antenna, which takes about an hour and costs less than $25 (not including the cost of your radio) using materials from your local hardware store. The antenna design I use comes from Kent Britain’s (WA5VJB) “Cheap Antennas for Low Earth Orbit” (available at wa5vjb.com/references.html), which is a great reference for building many different types of yagi antennas. Brass rods, 1/8" diameter, 36' long (3) Uncoated brazing rods work, but almost any brass rod or tube will do as long as it's approximately 1/8' diameter; $3-$4 each at a hardware or craft store. Square wooden dowel, 1"x1"x30" or longer if you want a handle longer than 10" for attaching to a tripod or mounting the radio. Approximately $2-$3 at hardware or craft stores. UHF FM radio like a police scanner, such as the Uniden BC72XLT handheld scanner, www.amazon.com, $85. Or, if you have a ham radio license, a UHF transceiver such as the Yaesu VX-7R, universal-radio.com/catalog/ht/0777.html, $308. 1. Measure and drill the wooden beam. 2. Measure and cut the brass rod. 3. Assemble the rods in the beam. 4. Prepare the coaxial cable. 5. Connect the coax cable. 6. Secure the coax cable. 7. Figure out where to point your antenna. 8. Find the frequency to tune in to. 9. Go out and listen! 10. Trace the path of the satellite's orbit. Step #1: Measure and drill the wooden beam. Use a pencil and ruler to draw a centerline down one long side of the wooden beam. Then measure and mark hole locations on the centerline (except holes d and e) at the following intervals: hole a 1" from one end; hole b 6 1/2" from a; hole c 6 3/4" from b; holes d and e 2 3/4" from c, 5/8" apart and equidistant from the centerline; and hole f 2 1/2" from d and e.
Drill 1/8" holes completely through the beam at each point. Be careful when drilling d and e not to blow out the sides of the beam. Step #2: Measure and cut the brass rod. Use a marker and ruler to mark 5 pieces of brass rod at the following lengths: 21", 13 1/2", 12 1/2", 12 1/4", and 11 3/4". Secure the rod in a vise, cut to the measured lengths using a hacksaw, and file the ends so they’re no longer sharp and dangerous. To make the driven element, place the 21" rod in the vise, mark it 13" from one end, center the mark on the broomstick, then bend it 180° around so it’s J-shaped. Trim the rod so it measures 13" from one end to the center of the 3/4" curve, and 7" from the other end to the center of the curve. Step #3: Assemble the rods in the beam. Insert the 11 3/4" element into hole a, the 12 1/4" element into b, the 12 1/2" element into c, the J-shaped (driven) element into d and e, and the 13 1/2" element into f.
Center all the elements, and secure them in place with hot glue. Step #4: Prepare the coaxial cable. To prepare the coaxial cable, cut off one of its connectors and strip 3" of outer insulation off that end, being careful not to cut the wires. Separate the outer wires, twist them to one side, and strip 2" of insulation off the inner wire. Step #5: Connect the coax cable. Connect the coax cable to the 2 parts of the driven element near where they enter the wooden beam. Wrap the cable’s inner wire around the short leg of the J, and the twisted outer wires around the long leg. Step #6: Secure the coax cable. Secure the coax cable with a couple of zip ties. Step #7: Figure out where to point your antenna. To use your antenna, you need to find out where to point it and what frequency to tune in to. To find a good satellite target, visit http://heavens-above.com. To specify your location, select a Configuration option (map, database, or manual), plug in the necessary info, then click Submit. From your new location-specific homepage, select “All passes of the ISS” to track the International Space Station or “Radio amateur satellites” to track a ham radio repeater satellite. On the Radio Amateur Satellites page, click on one of the radio satellites you want to track from the Satellite column (such as AO-Echo, aka AO-51; SaudiSat 1C, aka SO-50; or AO-27), then show its pass chart by selecting “Passes (all)” above the globe. The pass chart lists all the satellite passes for the next few days. Each pass is listed by its times and locations in polar coordinates, for its start, maximum altitude, and end, with each pass typically taking about 10 minutes. The start and end points are defined as when the “bird” appears 10° above the horizon, and the maximum altitude (in degrees above the horizon) will vary. The azimuth for each location is listed in compass points. Make sure your location is listed correctly on the chart, and pick a pass during which the satellite will come close to directly overhead. Look for max altitudes that are 45° or higher — the higher, the better. In the example here, the second pass, on July 17 at 3:50, looks good since its altitude reaches 75°, but the first pass, on July 16 at 16:55, only comes up to 18°, which is very close to the horizon and difficult to pick up. Step #8: Find the frequency to tune in to. To find a radio satellite’s current frequencies, you have to refer to the authoritative web page for each individual satellite. Some references online, including AMSAT (http://amsat.org), aggregate frequency information for multiple satellites, but these can be incorrect and you often need to dig deeper. For HO-68, to give another example, you need to click the Organization listing to CAMSAT (http://camsat.cn), an amateur satellite organization in China, where you’ll see the sat’s active frequencies listed under its former name, XW-1. In a pinch, you can always just Google the satellite’s name to find its authoritative source. Step #9: Go out and listen! Once you’ve determined your target sat’s current downlink frequency (example: 436.7950MHz FM), tune your radio to that frequency, and you’re ready to go out and listen. Aim your yagi antenna directly at the satellite, with the shortest rods (directors) closest to the satellite and the longest rod (the reflector) farthest away. When the pass starts, aim the yagi toward the satellite, then sweep it right and left slightly until you hear something. You can also move the antenna up and down slightly as you sweep right and left. Also try rotating the antenna by twisting your wrist, adjusting its polarity to receive a stronger signal. If you’re using a whip antenna, hold it perpendicular to the satellite, and keep it perpendicular while you rotate it to get a clearer signal. Step #10: Trace the path of the satellite's orbit. Trace the path of the satellite’s orbit according to the pass chart, so that at its maximum altitude and its end time, the antenna is pointed in the corresponding locations. In our example, the antenna should be pointed east at 75° above the horizon at 3:55, and south at 10° above the horizon at 4:00. It can be difficult trying to catch the satellites, and you may spend a lot of time not hearing anything. The best method is to move the antenna around in small side-to-side and up-and-down motions until you hear a bit of audio. The Doppler effect makes the frequency vary by 0.010MHz, so as you trace the satellite’s path you’ll also need to twiddle the tuning a bit. Add 0.010MHz to your target frequency early in the pass, then gradually dial it down until it’s approximately 0.010MHz less than the listed downlink frequency by the end time. Visit the [Topic|Ham_Radio|Ham Radio page] to learn about Hamspeak. 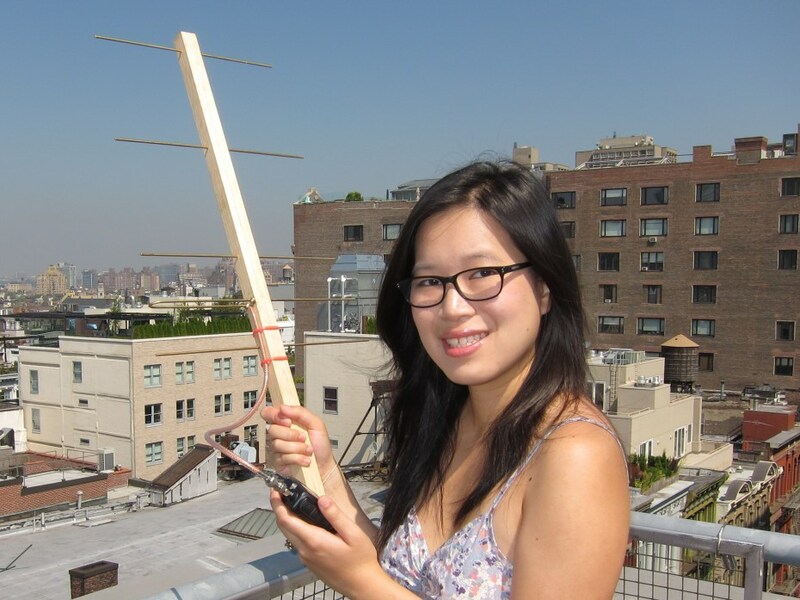 To learn more about how a yagi antenna works, watch Diana Eng’s MAKE video on directional antennas, aka “Seeing Radio Waves With a Light Bulb,” at https://makezine.com/go/yagi.